The card that I am showing today is a really fast and easy card. 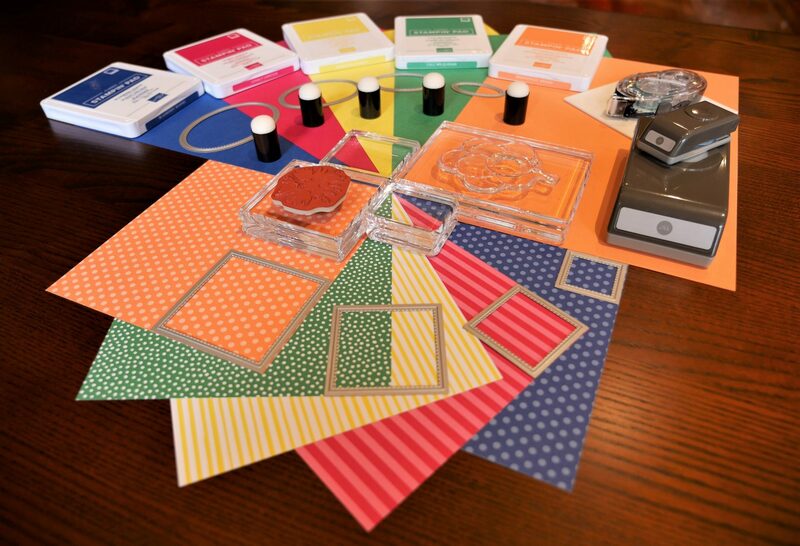 This set can only be purchased using Stampin’ Rewards. When you place an order of $250 or more, you will earn these rewards. For an order of $250-$500 the rewards are 10% of the order. If your order is $500-$750 the rewards are 12% of the order. $750-$1000 rewards are 14% and over $1000 the rewards are 15%. These Stampin’ Rewards can be used to buy anything in the catalogue and can also be used to purchase the host stamp sets. I have used the Tranquil Tide DSP. The pack of paper comes with all 4 of the 2017-2019 in colours. As you can see in the picture below it comes with 4 different designs (stripes and dots) in each colour.